A Union For Home Health Aides Brings New Questions To Supreme Court An Illinois case examines whether states may recognize a union for workers who care for disabled adults in their homes instead of state institutions, and whether non-union members must pay for a contract they benefit from. One of the questions before the U.S. Supreme Court on Tuesday is whether non-union members must pay for negotiating a contract they benefit from. 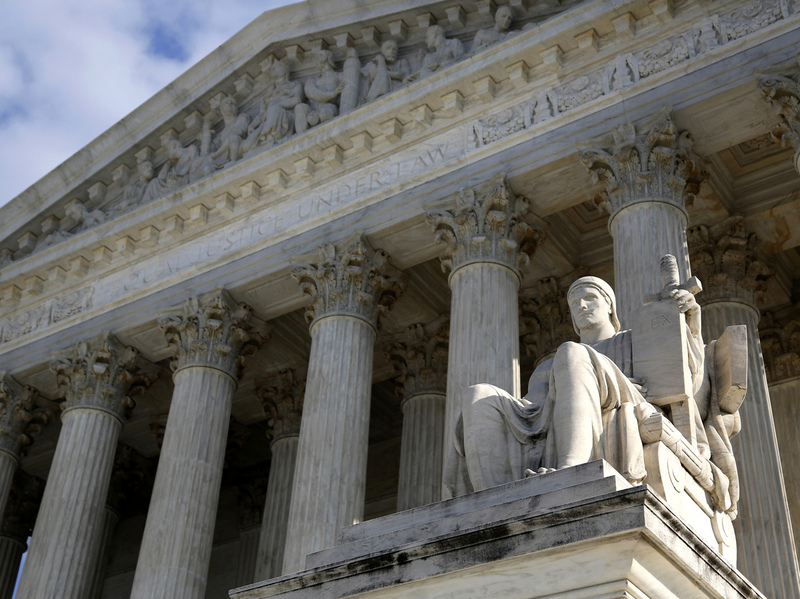 The U.S. Supreme Court hears arguments Tuesday in an Illinois case that could drive a stake through the heart of public employee unions. At issue are two questions: whether states may recognize a union to represent health care workers who care for disabled adults in their homes instead of in state institutions; and whether non-union members must pay for negotiating a contract they benefit from. "The home services program has about 28,000 home care aides, and these people are working in homes all over the state. There isn't a centralized workplace, and the goal for the state is creating and retaining a professional group of home care aides to meet the needs of what is an ever increasing population of older people with disabilities." Prior to the state recognizing the union in Illinois, turnover was huge, leaving large gaps in coverage for disabled adults. In the 10 years since unionization, however, wages have nearly doubled, from $7 to $13 an hour; training and supervision has increased, as well as standardization of qualifications, and workers now have health insurance. It's no surprise then that retention has greatly increased. What may surprise many is that this arrangement is cheaper, with savings of $632 million, according to the state. No one is forced to join the union, but non-union members — and there are three in this case — do have to pay the costs of negotiating and administering the contract. Under long-established labor law, when a majority of workers approve a union, those who do not join cannot be forced to pay for political activities of the union. But if the union is accepted by the state, as it was in Illinois, non-members still have to pay their fair share of the expenses of negotiating a contract. That's to prevent them from free-riding on the dues of members. For some workers, however, any fee is too much. "They just don't want to deal with this organization whatsoever," says their lawyer, William Messenger of the National Right to Work Legal Defense Foundation. Or, as Pam Harris, who cares for her son at home, puts it: "I object to my home being a union workplace." Harris, however, is part of a separate and much smaller group of workers, most of whom care for family members at home, who voted down union representation. So her only claim in this case is that she fears there will be another vote someday. Those who care for the bulk of the disabled are quite different. Not only did they approve union representation, most care for people who are not relatives. Those opposing any fair-share fee have several claims. First, they say the state is not their employer, because under this program, the individual patients, known as customers, hire and fire their own aides. The state replies that the program was designed that way because these workers would be in people's private homes. But the aides are trained and supervised by the state, equipped with supplies by the state and paid twice a month by the state, and the state can fire them. The second claim by the objectors is their view of the union as little more than a lobbying group. "Wages paid to government employees should be deemed a matter of public concern," Messenger says. Does that mean public employees simply can't have a union because they are dealing with the government, and the government, per se, involves political issues? "Yes, to a large degree. Yes," Messenger says. In other words, Messenger views bargaining for wages and health care as a political act. "I reject the notion that the [Service Employees International Union] somehow got higher reimbursement rates for them," he says. "Illinois could raise the reimbursement rates unilaterally." "[There are only] three people who are complaining here," counters lawyer Paul Smith, who will argue on behalf of the state and the union in the Supreme Court on Tuesday. "Not one of the plaintiffs has turned down the wages they have gotten as a result of union negotiations, or even said there is anything that the union is trying to get for them that they don't approve of," Smith says. And Smith notes that no one here claims that any of the fair-share money has gone for improper purposes like lobbying or political campaigning. Still, Messenger sees it differently. "The question is: Can individuals be forced to support a union if they don't want to? And our position is no," he says. In the end, what makes this case remarkable is that the Supreme Court for decades has allowed public employee unions, and has allowed them to require mandatory fair-share fees for nonmembers as long as those who do not join the union are not forced to pay for union political activities. But the current conservative court has not been enamored with labor unions, hinting just two years ago that it might be time to revisit its decades of doctrine on this issue. "If they say you can't have an exclusive representative union, that would be a stake in the heart of not just unions in the public sector but all unions," Smith says. And if the court were to say unions could not have a mandatory fair-share contribution to a recognized union, "you'd have a serious free-rider problem," he says, because people "would have no incentive to pay their share of the costs if they can free-ride on everybody else." The bottom line, Smith says, is that an adverse ruling "would substantially weaken unions."